East-Hawaiʻi homestead leaders sign an MOA with DHHL in order to receive community funds from the development of Waiākea Center. HILO, HAWAIʻI–On Fri., Jul. 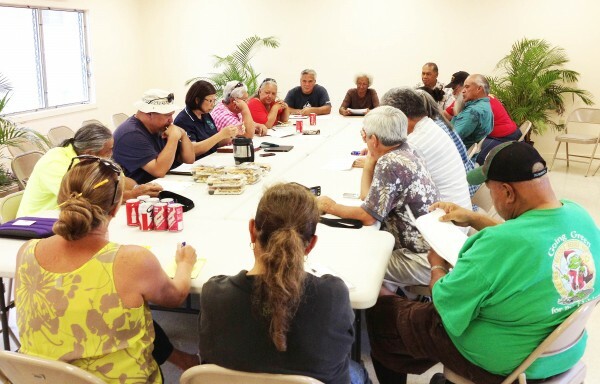 19, seven East Hawaiʻi homestead community associations came together to review and sign a memoradum of agreement (MOA) between the Department of Hawaiian Home Lands and their respective organizations for the disbursement of community benefit funds received annually from Waiākea Center. The seven associations are: Panaʻewa Hawaiian Home Lands Community Association, Keaukaha/Panaʻewa Farmers Association, Keaukaha Community Association, Inc., Piʻihonua Community Association, Kaūmana Hawaiian Homes Community Association, Makuʻu Farmers Association, and Kaʻū Hawaiian Home Lands Association. Funds allocated and disbursed for these associations will be used for promoting community development, educational and/or cultural programs and projects for the benefit of native Hawaiian residents of East Hawaiʻi Island. For the first year, the disbursement will be made to assist these associations in achieving state and federal non-profit status. In subsequent years, disbursements will be made to those who achieve state non-profit status and federal IRS 501(c)(3) certification. Now that the MOA has been signed by all seven associations, the first processing of the funds can begin. Follow us on our website in the coming weeks for notice on when and where the check presentations will take place.